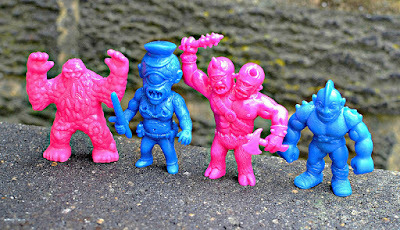 Gorelords is a new line of factory-produced mini figures from indie toy makers Violence Toy--a company that until now seems to have focused on larger, pricier vinyl figures. These things totally crept up on me. Until some very recent images posted on the Violence Toy Instagram account, there was no sign of their impending arrival. No Kickstarter campaign, no long buildup of production progress reports (at least that I'm aware). 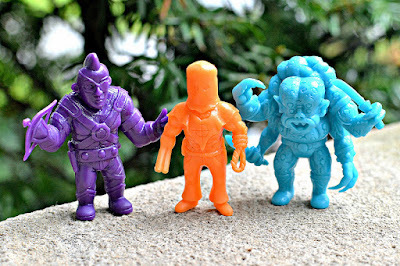 They just sort of dropped onto the scene all ready to invade our toy collections, and I'm sure glad they did because they're glorious hunks of plastic. 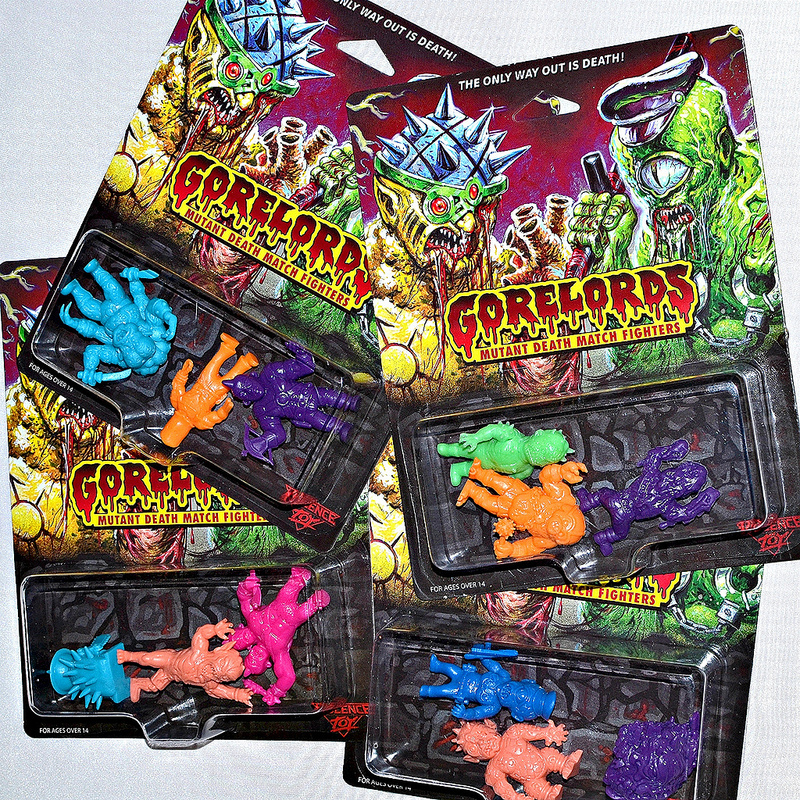 According to to Violence Toy, Gorelords should be going up for online sale via their online shop sometime over the next few days (I read $12 per pack somewhere, though I'm not sure if that's final). Violence Toy kindly reached out to me on Instagram to ask if I'd be interested in checking some out a bit early, and once I saw the message it took me about half a second to respond with a huge "YES!". Before we get into a closeup look at all of these little weirdos, let's go over a few basics. MATERIAL: Gorelords are made of a firm yet somewhat flexible plastic similar to that of MUSCLE. If you're familiar with other recent factory-produced indie mini figure lines like OMFG and Mystical Warriors of the Ring, you'll have a good idea of how they feel. SIZE: Most of the figures are around 2 inches tall, just a tiny bit bigger than MUSCLEs. With a few of them you can't even notice any size difference when compared to MUSCLE. They are very compatible with Monster in My Pocket as well. COLORS: Gorelords come in 9 different monochromatic colors that match up with the classic MUSCLE colors: Flesh/pink, light blue, dark blue, purple, magenta, neon orange, red, salmon, and neon green. Over the 4 packages I received, I got at least one of every color except for red and salmon. PACKAGING/ASSORTMENTS: The figures come in sets of 3 in carded blister packs, with 4 different assortments for a total of 12 different sculpts. They are being made available in flesh-only or multicolor packs, which contain all 9 colors. The package artwork is excellent and adds a lot to the overall presentation, featuring full-color detailed art on the front and black-and-white drawings of all the characters on the back--very reminiscent of packaging for obscure '80s mini figure lines like Weird Ball Wrestlers and Musclemania. 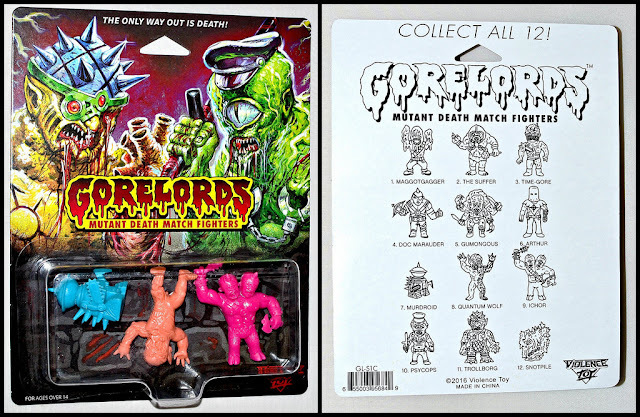 The package describes Gorelords as "Mutant Death Match Fighters" and declares that "The only way out is death!," which are cool touches because they provides just enough background for us to put our imaginations at work to think of storylines for these monsters. Now that we've got those details covered, let's take a closer look at all of the Gorelords! All these guys are awesome. Time-Gore and Maggotgagger give me a definite Weird Ball vibe, which is a great thing. The Suffer has a totally creepy psycho thing going on, and looks like he could do some major damage in whatever apocalyptic mutant war is at hand. This is probably my favorite of the four sets. I mean, we've got a 2-headed satyr-cyclops, a highly-weaponized killer robot, and a manic cyborg werewolf. A pack of mini figures does not get any better than that, folks. This is overall the least monstrous pack, with Doc Marauder and Arthur appearing human or at least humanoid. The former is very reminiscent of an '80s Musclemania figure by Select--I'd be shocked if that line wasn't the inspiration for the sculpt. But then we've got Gumongous, who is nowhere near human! This huge, 4-armed brute has a killer sculpt and is one of the definite highlights of the line. 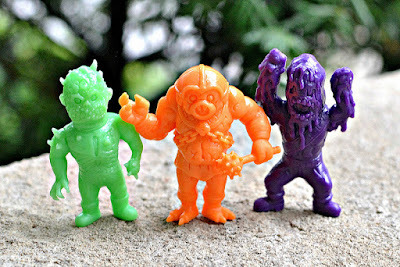 If you can't beat a mini figure pack consisting of a cyborg werewolf, 2-headed satyr-cyclops and murderous robot, a pack consisting of a cyclops cop, cyborg troll and a monster pile of mucus comes pretty damn close. And that's all of 'em! 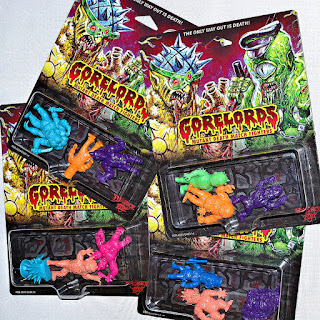 Are the Gorelords not fantastic? 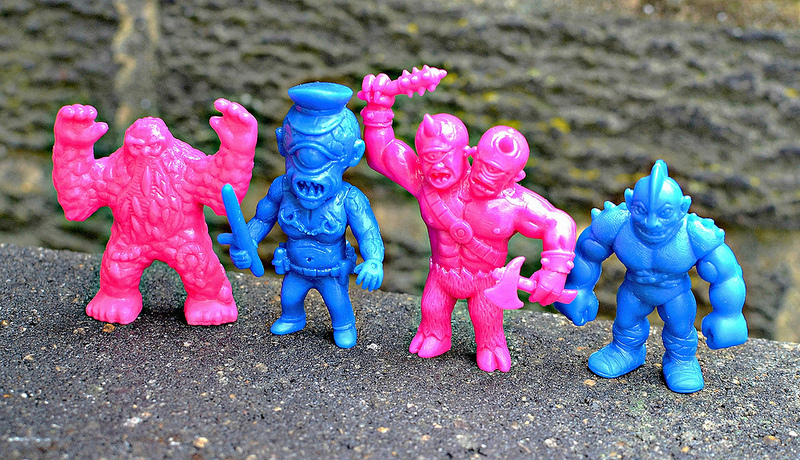 Thank you, Violence Toy, for bringing them into our lives (and toy collections). May you sell a ton and make many more of these little weirdo warmongers. Oh my gosh! If these sold for around $12 a set I'd buy all 4 in a heart beat. They are incredible! Yep! I knew they were gonna be great when I saw the pics online, but they're even cooler in hand. Those are great! Thanks for the heads up. Just ordered a "flesh" set last night, can't wait to get them! These really snuck up on me as well. They look great, and the card looks awesome too! I have to say Murdroid and Snotpile are my favs.